Although Alabama’s Smith Lake is generally known as a deep, clear reservoir (and very hard to predict when planning any fishing trip), it can be a tremendous fishery during the dead of winter. Why? 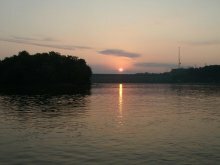 Spotted bass, largemouth bass and striped bass are plentiful in many parts of the lake during cold weather and an added bonus…wintertime lake draw down can really concentrate any school of bass found lake wide on Smith Lake. The sheer numbers of spotted bass to be found in Smith lake (impounded in 1961) is easily comparable to the normal amount of native largemouth bass generally found in any man made impoundment. 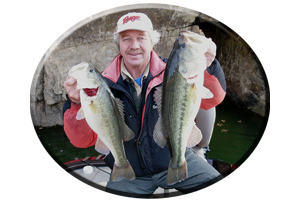 Meaning, these feisty, little hard fighting spotted bass can be tackled at any time, any where, when fishing any part of Smith lake’s 21, 200 surface acres of water. This includes a chance for those real trophy hunters at fooling some of Smith lake’s bigger, trophy-sized spotted bass. 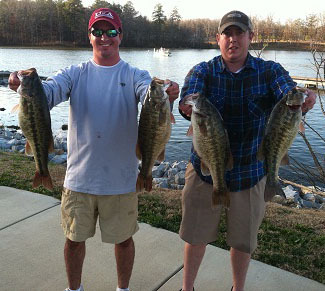 There were previously five world record spotted bass taken out of Smith Lake. These huge tackle testing “spots”, are often found undisturbed, holding in water depths that can exceed 100 feet deep during the dead of winter. Deep water, ranging from 50 feet to depths of 200 feet, is common in most parts of the lake. There is water even deeper, close to 500 feet deep in some places! The rocky habitat these huge, spotted bass call home varies in deep structure found lake wide. 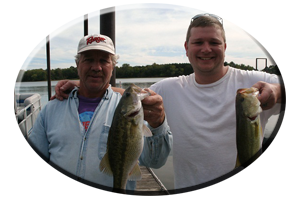 Very deep water (depths exceeding 50 feet deep), are places that very few anglers even attempt to fish on Smith lake. 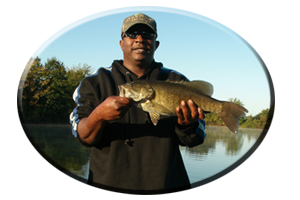 Most anglers that fish Smith lake with any regularity are used to fooling Smith lake’s bass when dabbling their lures (or live bait) in depths of 30-50 feet of water. That’s fine for spotted bass in the 1-5 pound range. 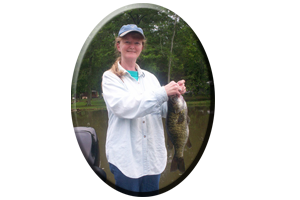 But there are bigger spotted bass often found in deeper water on Smith lake. There are literally hundreds of schools of spotted bass that roam Smith lake from shallow water to the lakes deeper depths in their constant search for food. Minnows, small game fish, bait fish and crayfish are the main staple of their diet during the winter months. Some spotted bass may scrounge the lakes bottom in their search for food this winter. Rock-dwelling crayfish are a diet these bass adore during the winter months. Crayfish are very high in nutrition, they help put on the needed fat reserves to make it through a tough cold winter and crayfish are very plentiful during the winter months on Smith Lake. Crayfish imitating lures should be experimented with. The clear water found on Smith lake can often be somewhat of a hindrance for anglers that fish with to big of a lure. “Smaller is better” is generally the rule in clear water situations and Smith lake is no exception. Jigs, jig combos or small plastic crayfish are good choices. Natural colors like watermelon or pumpkinseed are good in winter. Along with these crayfish imitating lures, Smith lake anglers should try using lures that simulate small worms, eels, leeches, water dogs or lizards. These are deadly lure choices for some often very picky eaters. Other schools of spotted bass may suspend out over deep water, staying on the move as they follow the schools of bait fish such as threadfin shad, gizzard shad and even schools of small bream or small rock fish. Fishing in various depths with lures like 1/2 to 3/4 ounce jigging spoons, will eventually reveal the preferred depth these bass are holding in during winter. * When feeding, many of these spotted bass of winter, are generally relating to places that are highly visible to the bank-beating angler. This can mean — even during the cold winter months when bass are believed to go deep — anglers should still be targeting places close to shallow water. Such as fishing along deep rock bluffs walls, small cuts and pockets found along rock bluff banks, broken-off rocky banks, banks featuring slab rocks, huge boulders or scattered ball-sized rocks, rocky main lake points, rock-lined creek mouth points, man made rip-rap rocks, rock walls, all around rocky islands and along any boulder-strewn flat. These types of banks — very visible with low water during the winter — are featured from Smith lake dam to the lakes headwaters. Although rocks or boulders are generally featured in these types of places, there is “cover within the cover” that will attract both Smith Lake’s famed spotted bass and largemouth bass to the same places. The persistent angler that really probes deep into all types of cover will hook into an occasional largemouth bass. Laying trees, brush piles, stumps, logs and even man made piers and boat houses hold the majority of Smith lakes cover-dwelling largemouth bass during the entire winter season. So keep in mind both spotted and largemouth bass species can be found often mingling in places that not only feature rocky terrain, but in addition, a mixture of wood and rock cover or a slight bottom irregularities as well during the winter season on Alabama’s Smith lake. You may find spotted bass holding along a point or bluff bank. But thoroughly probing any wood cover within these rocky places with your tempting bottom dragging offerings may eventually coax out a really big largemouth bass this winter season. 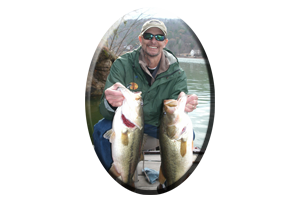 There are world record sized spotted bass in Smith Lake and make no mistake about it there are largemouth bass exceeding that magical mark of ten pounds as well. So don’t rule out the 500 miles of shoreline featuring visible shallow water cover, places the largemouth bass prefer on any lake during winter. Experiment with your lure choice and try various techniques this winter season on Smith Lake. Both the FLW Outdoors tournament trail and Bassmasters have shown professional anglers using a variety of lures that will work under any wintertime condition on this lake. Warming trends show some bass move shallow hitting topwaters, spinnerbaits, shallow running crankbaits and jerkbaits. Small finesse worms fished on jig heads work any time for bass that really scrutinize a lure in Smith lakes clear water situations during winter. Deep water techniques can range from drop shotting, vertical jigging spoons, fishing shad imitation plastics on jig heads and fishing with Texas or Carolina-rigged plastics such as small worms, lizards, crayfish imitations, tube baits or creature baits. * Or you can call always call on Reeds Guide Service (205) 663-1504 for fishing Smith lake or any Alabama lake, year round! Gift Certificates are available – Please call (205) 663-1504 or E-mail me at;alabassgyd@aol.com Discounts available!